While advocates of a Boulder White-Clouds National Monument contend that the resulting publicity would boost economic growth in the area, Custer County officials and residents have doubts, which they expressed during a joint meeting of the Blaine and Custer County commissioners in Sun Valley last week. Studies on the subject provide ammunition to both sides. A study commissioned by the Idaho Outdoor Business Council and the Idaho Conservation League projected that if a Boulder White-Clouds National Monument is created, it would produce an increase in visitation, and a corresponding increase in spending, of 10 to 33 percent. 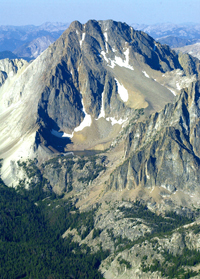 Called “The Economic Impact of the Proposed Boulder White Clouds National Monument,” the study was carried out by economist Don Reading of Ben Johnson Associates, a business and public-policy consultant in Boise. It was released in October 2013. Reading said in an interview that his contract with the ICL stated that the organization would not interfere with his methods or conclusions, and the organization has stuck by that promise. Based on current visitor spending on the Sawtooth National Forest, the study estimated an increase in the region’s total economic output by $3.7 million to $12.3 million per year. It projected creation of between 47 and 155 jobs in a four-county area. The study based its visitation conclusions on a study done in 2012 by Denver-based BBC Research & Consulting that showed visitation more than doubling at four national monuments created in 2000 and 2001. The Ben Johnson study also considered other studies that analyzed the economic vitality of surrounding communities before and after monuments were established. They generally found significantly increased economic activity in those regions. The major cause of the new economic vitality was deemed to be permanent migration there of people attracted by the perceived new amenity. One such study found that Western non-metro counties average $436 more in per-capita income for every 10,000 acres of protected lands within their borders. The Ben Johnson Associates study also cited a Headwaters Economics analysis that found that the local economies surrounding 17 national monuments grew following creation of the monument. The Ben Johnson Associates study stated that while the other studies stopped short of claiming a direct cause-and-effect relationship, they provide evidence that protected areas are consistent with economic health. Two other recent studies, however, came to the opposite conclusion. Three faculty members from Utah State University and Southern Utah University researched the economic consequences on Kane and Garfield counties in Utah following designation of the Grand Staircase-Escalante National Monument by President Bill Clinton in 1996. Their study used U.S. Census Bureau and other data from 1990 and from 2000 to compare economic and demographic changes in those two counties with the changes that occurred in 187 other similar counties in the United States. The paper, titled “Politics, Economics, and Federal Land Designation,” was published in the Mountain Plains Journal of Business and Economics in winter 2013. The study used three economic variables—non-farm payrolls, per-capita income and tax receipts. It found no significant difference in the latter two categories between Kane and Garfield counties on the one hand and the other counties. However, it concluded that the two Utah counties lagged in non-farm payroll growth by an estimated $146 million over the 10-year period. “Those that claim that we can have our cake and eat it too, with conservation-driven protection designation also improving economic conditions, have failed to evaluate and understand the data fully—we do not find evidence supporting that claim, and find some evidence to the contrary,” the researchers stated. “I don’t know what ‘like counties’ means, because I think the Grand Staircase-Escalante is pretty unique,” he said. That study followed another one by the same three authors done in 2011 on the economic impacts of wilderness designation. Titled “The Economic Costs of Wilderness,” the study compared the economies of every county in the United States dating back to 1995. It concluded that average household income within counties that had designated wilderness was $1,446 less than non-wilderness counties. Total payroll was estimated to be $37,500 less and county tax receipts $92,910 dollars less. The authors stated that those studies are only the beginning phase of a more expansive effort exploring how wilderness and other federally protected lands impact the economies of rural counties and the quality of life there. “Perhaps more modest designations of land could provide a county the economic benefit of providing additional amenities without precluding the same proportion of development of extractive industries, potentially leading to a positive net effect,” they stated. Ever since the creation of the Sawtooth National Recreation Area in 1972, Custer and Blaine county residents have been pursuing a similar goal—protection of the land while allowing a variety of recreational activities and ranching. The most common sentiment expressed at last week’s joint commissioners meeting was that the compromise is so far working well. Groups pushing for monument designation by the federal government have identified an area of nearly 600,000 acres to be included in the plan. The existing Sawtooth National Recreation Area includes 756,000 acres, much of which overlaps with the proposed monument acreage.